Hello Readers! 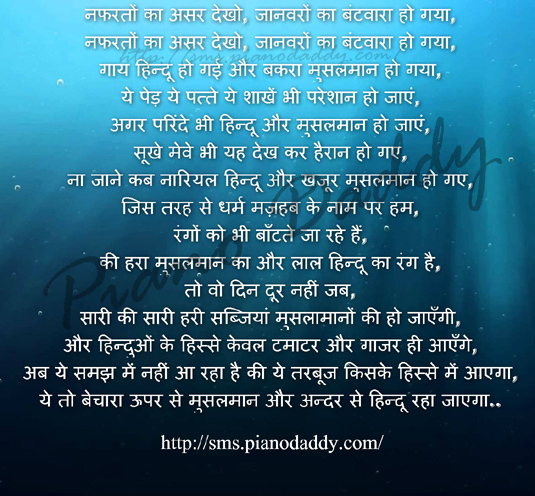 Read A Beautiful Poem Written On Hindu And Muslim. By This Poem, Poet Want To Give A Beautiful Message To All That, Do Not Fight With Each Other, Before Hindu And Muslim's, We Are Human Being, We Have Same Colour Of Blood In Our Bodies. Please Read How Poet Say His Feelings In The Form Of Poem. Read And Share. ये तो बेचारा ऊपर से मुसलमान और अन्दर से हिन्दू रहा जाएगा..